Lewis, James R. Who Serves Satan? A Demographic and Ideological Profile // Marburg Journal of Religion. — Marburg: Philipps-Universität Marburg, 2001. — В. 6. — № 2. — С. 1—25. 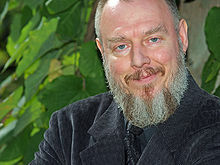 Melton J. G. Church of Satan // Encyclopædia Britannica Online. — Encyclopædia Britannica, 2008. Архивировано из первоисточника 4 Հունիսի 2008. Սատանիզմը որպես աշխարհայացք // РСА, 2004—2006.